Unfortunately, pigeons carry a surprisingly large number of diseases that are transmissible to humans (called "zoonoses"). And they have few effective predators, which means that their numbers are fearsome indeed. 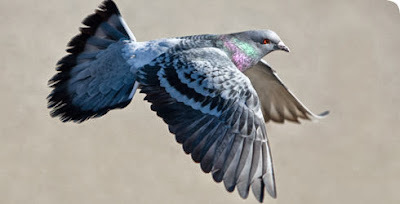 We probably won't be rid of the ubiquitous pigeon any time soon, no matter how many peregrine falcons make the rooftops of our skyscrapers their home. 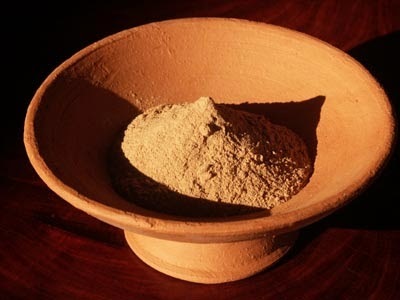 The primary means of transmission is through the droppings. 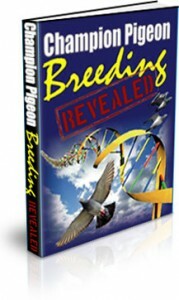 The infected pigeon's droppings have the infection vector in them (be it a virus or a bacteria). When these droppings dry, they become powdered and float up into the air as dust, kicked up by passing feet. You inhale the pigeon dropping dust and bingo: pigeon disease. I was reminded of my former pigeon disease tracking hobby when I read this heartbreaking article in the Canadian newspaper The Globe and Mail, about a woman who contracted an extremely virulent and dangerous form of pigeon-borne meningitis. She came down with a terrible migraine, then she was hospitalized, fell into a coma for several days, and woke up blind. Richards was lucky to be 23, young and strong and fit. Anyone in lesser health would likely have died. We think of these as being food-borne illnesses. But the salmonella and listeria bacteria are also carried by pigeons. These diseases are no joke: listeria is particularly dangerous for pregnant women and babies, as it can cause "meningitis in newborns, abortions, premature delivery, stillbirths, and death." 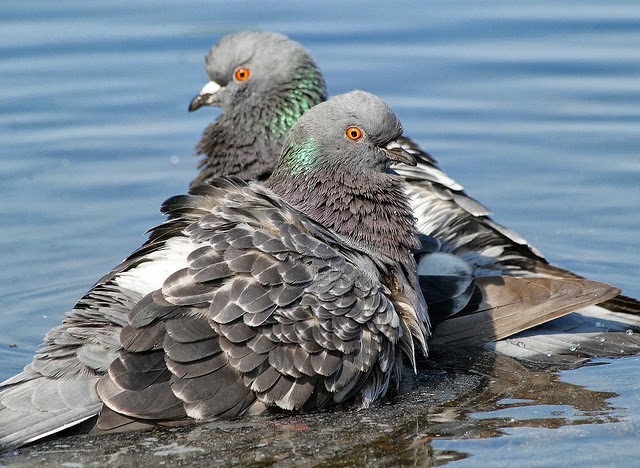 Pigeons are one of the primary reservoirs of West Nile virus, Western Equine Encephalomyelitis, and St. Louis Encephalitis. These variable diseases can cause anything from temporary illness to permanent nervous system damage or death. They are particularly dangerous to children and the elderly, where they frequently prove fatal. The transmission vector in the case of these diseases is the mosquito. A mosquito bites an infected bird, then bites a person. As it bites, it backwashes the infected bird's blood into your blood stream. Mosquitoes definitely deserve a whole 'nother level of loathing, as mosquito-borne diseases account for a staggering number of human deaths worldwide. 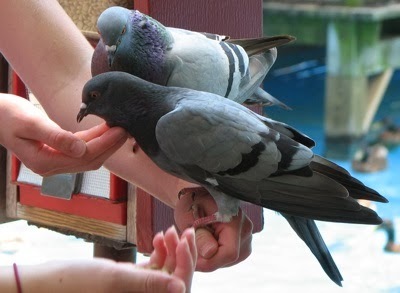 If you are worried about e. coli infections from under-cooked meat, you should also be washing your hands whenever you spend time in a pigeon-rich environment. can catch from pigeons. I understand why people might like pigeons and want to feed them. 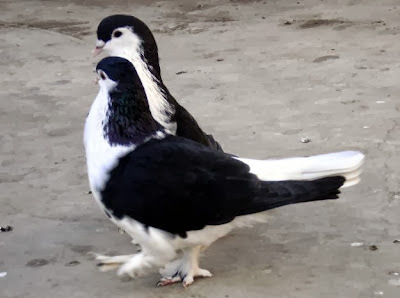 There is precious little animal interaction in the city, and if you don't (or can't) have a dog or cat, then the city pigeons may well be your only connection with animals. And they are just so very willing to be fed and entertained. A nervous symptom of PMV. Often, the head will twist fully upside-down. 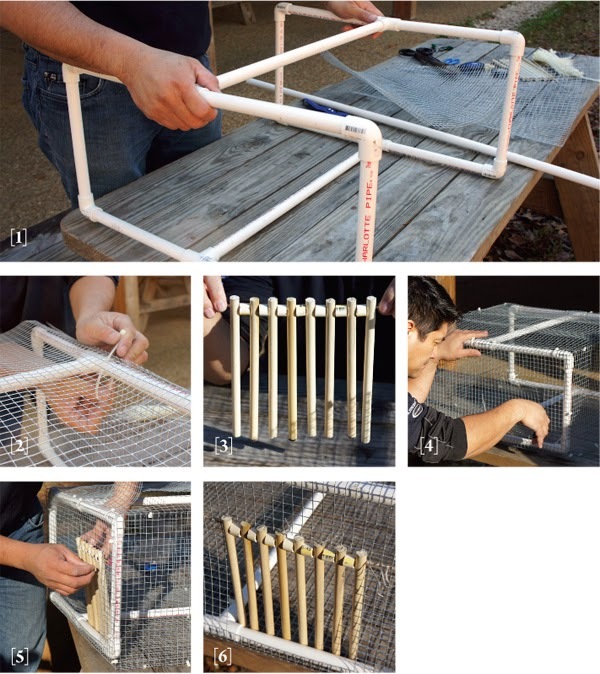 Incubation period can vary from a few days to several weeks. It is most often of moderate virulence with 5% to 10% mortality, but rarely highly virulent strains can cause 90% mortality. Mortality rates are significantly higher if supportive care is not given (eg. when the virus is injected experimentally in a laboratory). Water deprivation and stress increase mortality. Spontaneous recovery within 6 - 12 weeks is common, but recovery can take longer. Nervous symptoms can persist for life or return in times of stress. 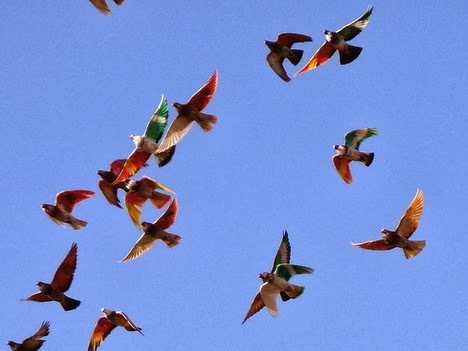 Some pigeons will suffer from persistent diarrhoea after recovery. 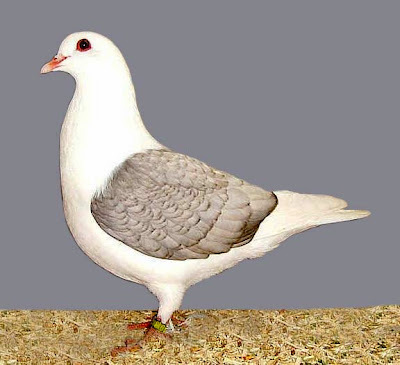 Diarrhoea is often the first symptom, but feral pigeons will not often come to the attention of a rescuer until the nervous signs appear. Not all symptoms will be present at the same time. All symptoms are aggravated by excitement. Twisting neck, head upside down (torticollis, star gazing) - see photo. During the recovery period keep pigeons with Pigeon PMV in a quiet, warm (not hot) cage with soft flooring away from any intense light source. Towelling is ideal for flooring as they can damage their feathering if they have fits. Provide a brick for perching. 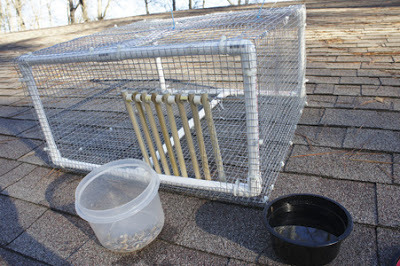 Place seed in a deep dish so that if they stab at random they can pick seed up. Hand feeding may be necessary. 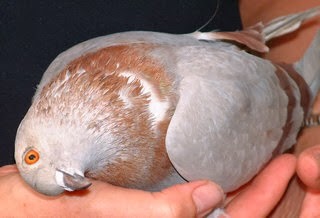 If feeding by gavage tube is not an option the pigeon's mouth has to be opened and the food pushed to the back of throat. 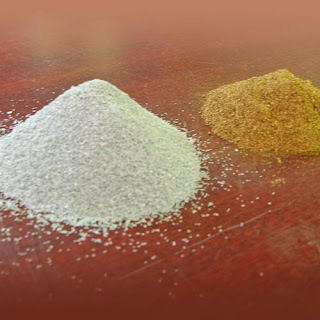 Suitable foods that can be fed this way include pellets of egg food paste dipped in water, small soaked pieces of dog biscuit, frozen peas and sweetcorn thawed in hot water for about 20 - 30 minutes (not tinned). 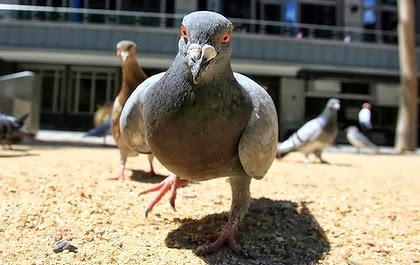 Weigh the pigeon daily and carry out a poop count to ensure that he is getting enough food. As a guideline: a healthy pigeon will pass between 20 and 30 raisin sized poops a day. The disease runs its course in about 6 weeks, by that time the pigeon has stopped shedding the virus and won't infect other pigeons but nervous symptoms and gastro-intestinal may persist longer. 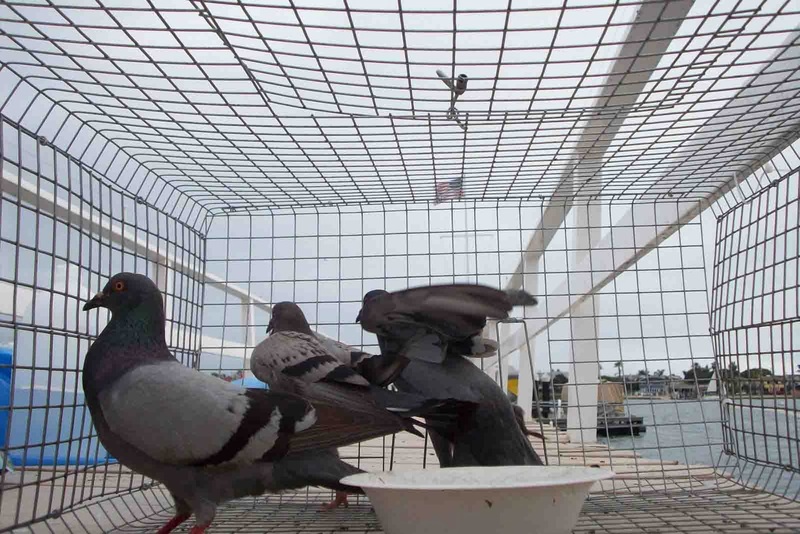 In a loft situation it is important to vaccinate pigeons against Pigeon PMV. 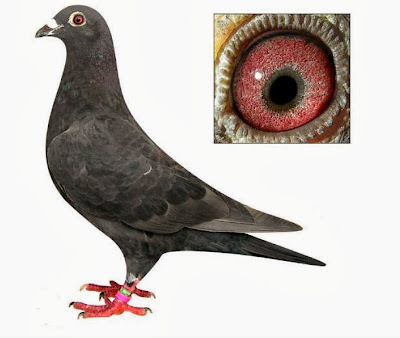 Remember that it is the pigeon that is not showing any symptoms of Pigeon PMV but is shedding the virus that is the greatest danger to other pigeons. 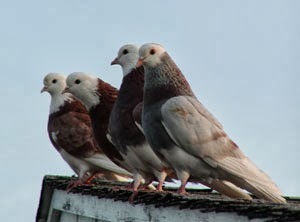 By the time the obvious symptoms appear the virus could have infected other pigeons in your care. Always isolate new pigeons. They can be vaccinated if they show no signs of the disease after 10 days in quarantine. 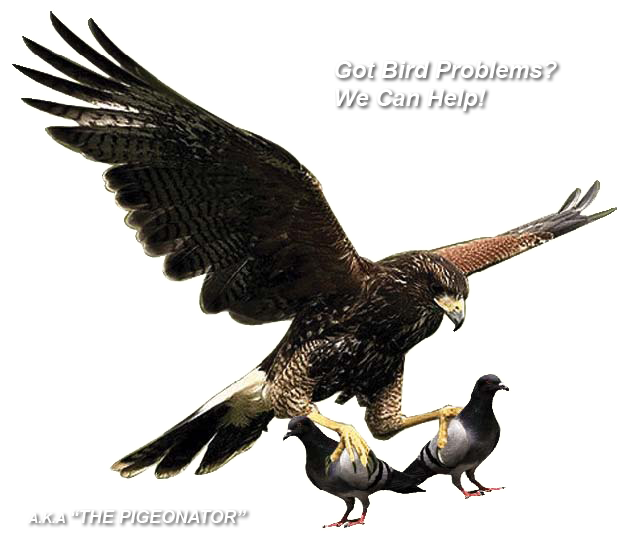 A problem with pigeons can be a real nuisance to businesses. Pigeons are attracted to food sources, including garbage, which is why they are often found near bars and restaurants and landfill sites. Look out for the following signs on your property, which may indicate a problem with pigeons requiring professional services. 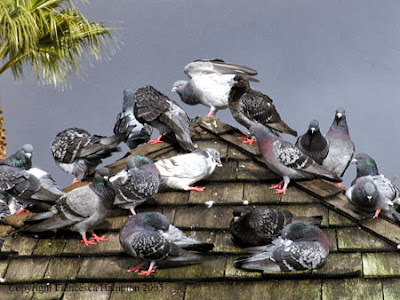 The presence of feral pigeons and their feces (or guano) represents a potential health hazard to people. 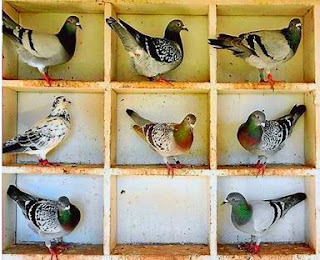 Pigeon droppings - droppings provide the ideal environment for organisms causing diseases such as listeriosis, cryptococcis and aspergillosis to thrive. 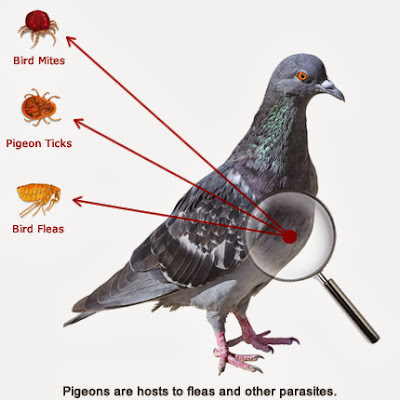 Other pests - pigeons are also hosts to fleas and other parasites such as pigeon ticks and bird mites.These pests can be spread to other hosts including people. Pigeon droppings and pigeon debris not only look unpleasant but they can directly damage the structure of a building, due to the concentration of uric acid found in droppings. Damage stone and brickwork - tar based roofing materials are particularly vulnerable to this type of erosion. Nest debris and feathers can also block gutters and rainwater drainage systems, potentially leading to damage to your business from water penetration. 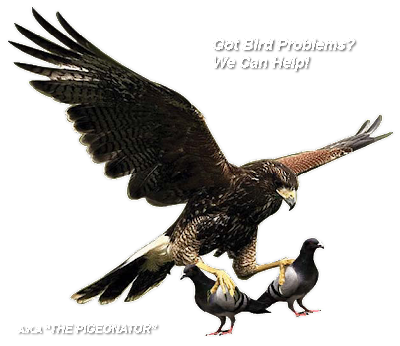 One of the most successful long term measures for pigeon control is their food source removal, however in busy urban areas this is not always practical. 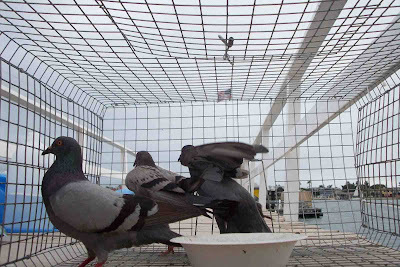 Bird netting – available in various sizes and strategically installed for total pigeon exclusion. 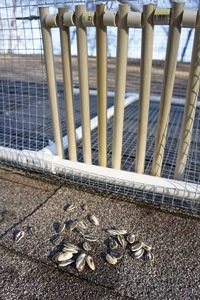 Wire deterrent systems – discreet product used to protect exposed ledges from pigeons and other pest birds. 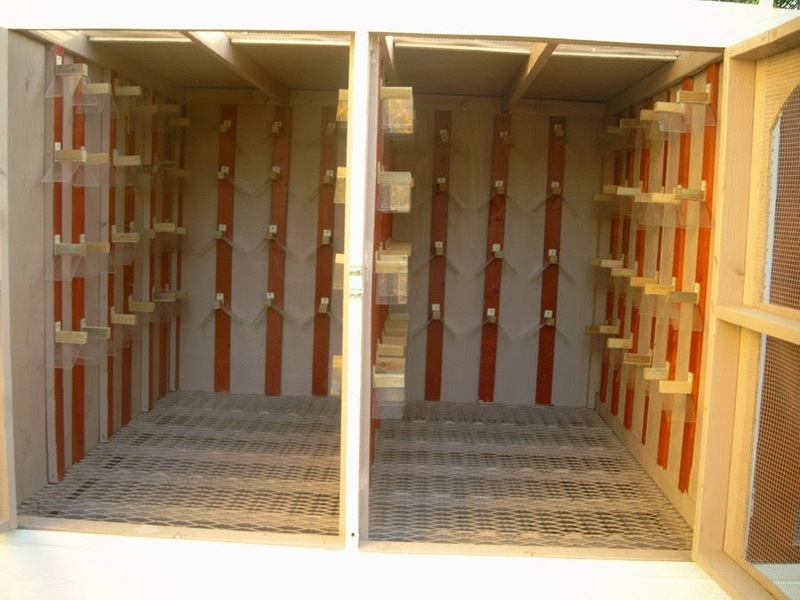 Bird control solutions – our full range of specialist bird proofing methods are installed by our bird control specialists.